George Stephenson was an English civil engineer and mechanical engineer. 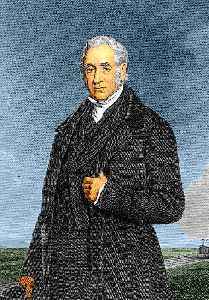 Renowned as the "Father of Railways", Stephenson was considered by the Victorians a great example of diligent application and thirst for improvement. Self-help advocate Samuel Smiles particularly praised his achievements. His chosen rail gauge, sometimes called 'Stephenson gauge', was the basis for the 4 feet 8 1⁄2 inches (1,435 mm) standard gauge used by most of the world's railways.